Rebecca Kiss/Photography Editor Senior long stick midfielder Timothy Mattiace was named a captain on the men’s lacrosse team as he enters his final season as a Bearcat. 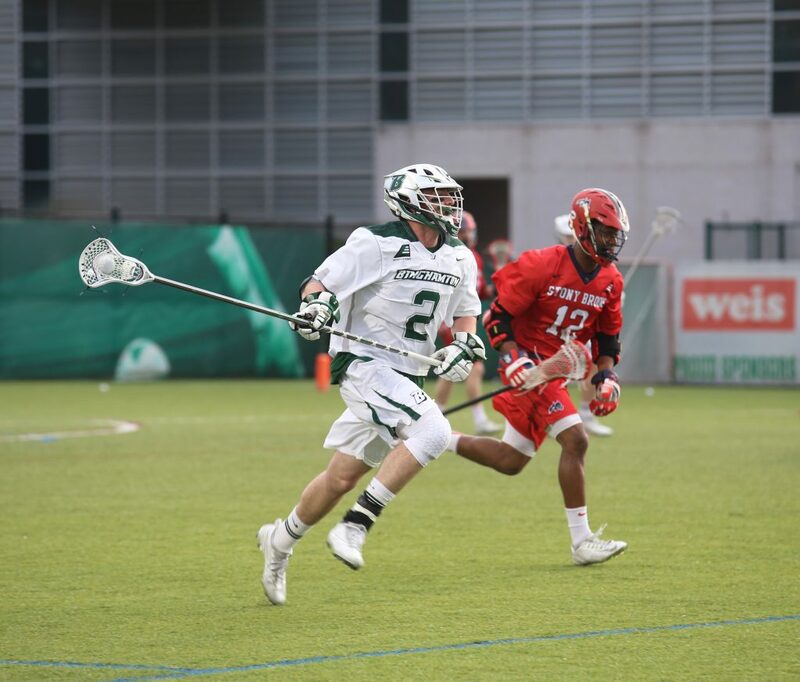 Heading into last season, expectations were high for the Binghamton men’s lacrosse team. The Bearcats were coming off a season in which they attained the most wins in program history and advanced all the way to the America East (AE) Championship for the second time ever. The 2018 season, however, was defined by just four wins, one AE victory and a sixth-place conference finish. Despite the hardships of last season and a sixth-place finish in the AE preseason poll, the Bearcats remain optimistic and are looking to improve their record this season. With some of BU’s top scorers from last year lost to graduation, the team is placing an emphasis on new leadership. Senior long stick midfielder Timothy Mattiace and senior midfielder Joe Licata are taking over as captains this season. The pair was an essential part of the team last year. Mattiace picked up 24 ground balls and caused 21 turnovers, while Licata netted 11 goals and picked up 16 ground balls. Now, both players have the opportunity to showcase their leadership skills in the 2019 campaign. While Mattiace and Licata are essential, there is also a number of up-and-coming players who will contribute to the team. The roster now includes 13 new members — 12 freshmen and one transfer. With 13 new players and only 10 spots available on the field, every new player is determined to stand out. With some returning members and several new faces, the Binghamton men’s lacrosse team is hoping to come out with a victory in its opener against No. 18 Colgate. Colgate recently upset No. 10 Syracuse, but the Bearcats are using that result as fuel for Saturday’s game. The Bearcats will host the Raiders on Saturday, Feb. 16. Faceoff is set for 1 p.m. at the Bearcats Sports Complex in Vestal, New York.